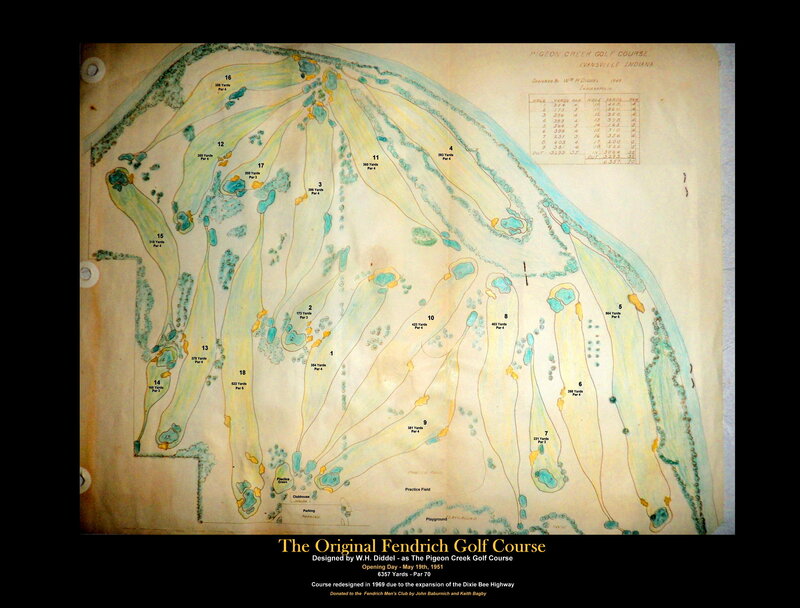 The Original Fendrich Golf Course - 1951-1969 - Evansville, IN. with this original design, by iconic Hoosier figure W.H. Diddel. course lost three holes and was redesigned in 1969 and re-opened to today's layout. Hole #1.- 354 Yards - Par 4. - Same green as today except the tee was 20 yard back. Hole #2 - 173 Yards - Par 3. - Tee was today's #9 tee, hit to the south. Hole #3 - 396 Yards - Par 4. - Tee in the middle of today's #9 fairway and you played to today's #2 green. Hole #4 - 383 Yards - Par 4. - Today's #13 Hole. Hole #5 - 564 Yards - Par 5. - Today's #14 tee played to today's #15th green. Hole #6 - 398 Yars - Par 4. - Today's #16th hole. Out of bounds right. Hole #7 - 231 Yard - Par 3 - The green is today's #17 green but tee was 231 yards back making you have to carry the sandtraps. Hole #8 - 403 Yards - Par 4 - Tee was back near the near the Weinbach/Diamond Ave curve and played to today's #10 green. Hole #9 - Tee just to southwest of Today's #10 green and played as a dogleg right to today's #18 green, Out of Bounds right. Hole #10 - 423 Yards - Par 4 - Tee was today's #10 tee to a green that was a between today's #2 tee and today's #10 green. Hole #11 - 360 Yards - Par 4 - Tee was near the large tree left of today's #11 green and played to today's #12 green. Played as a large dogleg right. Hole #12 - 350 Yards - Par 4 - Today's #3 hole. Hole #13 - 378 Yards - Par 4 - Todays' #4 tee and went to a green near Diamond avenue. Now part of US Highway 41. Hole #14 - 166 Yards - Par 3 - Tee headed south towards today's #4 green, If you were long and left you were in the big hole in front of today's #5 tee. Hole #15 310 Yards - Par 4 - Dogleft left with tee along today's US 41 towards north/northwest. Hole #16 356 Yards - Par 4 - Today's #6 hole. Hole #17 200 Yards - Par 3 - Tee was today's #7 tee that played to about to top of the hill in today's #7 fairway. Hole #18 - 522 Yards - Par 5 - Teed off from the the top of the hill on today's #7 hole and played south to a green near Diamond Avenue. Out of bounds right and left on 2nd shot. Most players remember the course with the front and back nines reversed. Bob Gerst won the 1953 Fendrich Open and the nines had been reversed by then. Donnie Shull, Keith Bagby and Steve Pritchett helped remember and describe the old course.